I was looking through this list of old, racist advertisements. What is "Dis sho' am good" supposed to mean? I'm assuming it's some sort of attempt at stereotypical vernacular language or something, but I really am not sure how to decipher it. As other people have said, it means "this sure is good." The re-spelling of this as "Dis" represents the change of the voiced dental fricative /ð/ to a plosive [d]. This sound change occurs at the start of words in a number of varieties of English, including but not limited to what is called "African-American Vernacular English" (abbreviated "AAVE," which has also been called "Ebonics", although my impression is that this term is now considered outdated). It's generally seen as informal or uneducated. The spelling "sho'" represents several phenomena: the change of the vowel in words like poor to rhyme with words like pore (which is widespread and not usually stigmatized), the loss of "r" at the end of syllables (accents that do this are called "non-rhotic"), and possibly the merger of non-rhotic "or" with the "o" sound of words like go (I don't know much about this last phenomenon: Wikipedia suggests it exists and calls it the "Show–sure merger", citing Wells (1982) in a sentence saying the merger occurs for "some southern U.S. non-rhotic speakers, some speakers of African American Vernacular English and some speakers in Guyana"). Similar examples are the spelling "ho(')" (used to represent a particular pronunciation of the word whore) and "po(')" (for poor). U.S. regional (chiefly south. and in African-American usage) and Eng. regional 18– am. 1977 G. Smitherman Talkin & Testifyin 15 Everything I tells you am the truth. It is not a part of standard English at all, and it looks like it may not be part of most varieties of modern AAVE either, but it isn't necessarily just a racist invention of the ad writer. Some people apparently do, or did, use "am" this way in speech. I hadn't encountered this usage before reading your post. The only time I've ever encountered am used this way is in a 1988 column by Atlanta humor columnist Lewis Grizzard. It was about Presidential candidate Michael Dukakis preparing to visit the South. From memory: "Grits have always puzzled me," he says to an aide. "Is it 'grits is' or 'grits are'?" "Am, sir." is the reply. Dukakis tries it out: "These grits sho'nuff am good." Overall, it is an example of stereotypical vernacular that was associated with Southern black speakers. Each of the dialectal features seems to have a basis in reality, although the use of them together with the fictional "Uncle Remus" character in the ad is obviously intended to evoke a particular effect and probably wasn't motivated by concerns of realism. It means This sure is good said with this kind of 'accent' is what spawned Thing Fish's dialect, similar to the way a character named King Fish spoke on the US radio program Amos & Andy. I'm not asserting that this must be the meaning, yet I can't help but being reminded of the idiom "show `em good": which means something like to prove something to someone or group; to teach them a lesson, and such. They didn't think Bobby had anything in him, but when he won that race, he sure showed `em good. De Big Bethel chu'ch will fine um! This suggests that in the when black speech was caricatured in the writing of the time, various spellings were used. Words like "them" or "him" could end up as "am" or "um". That does somewhat bolster the plausibility of "show `em good". 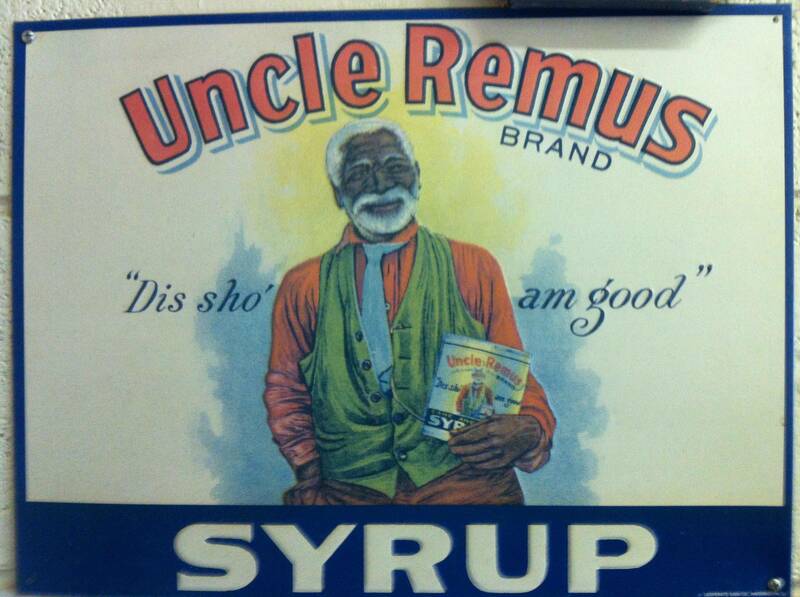 The product labeling could be conveying the idea that this awesome syrup sticks it to the naysayers who didn't believe in Uncle Remus or his syrup product. Not the answer you're looking for? Browse other questions tagged history phrase-meaning vernacular or ask your own question. What does this phrase mean: «smth isn't exists»? Question 100,000: What will English look like in 500 years? What does “scrap it out ” mean in this context? What does 'six-month filing' mean in this video? What does the “limited” mean in this sentence?